Please forgive me for not dropping a Sunday’s For Teachers blog yesterday. No excuses. BUT, to make up for it, I’m reviewing a different book each day this week, starting with this soon to be released book from Scholastic. 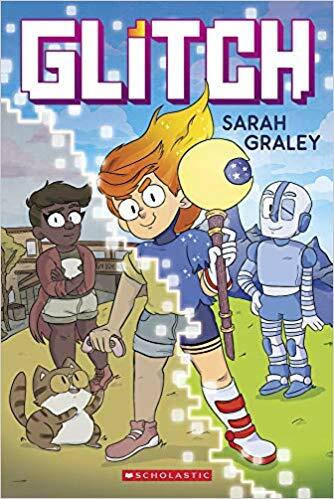 I was lucky enough to receive an advanced copy of Sarah Graley’s Glitch from Scholastic a while back. I wanted to wait until it got closer to the release date to review it so no one would forget to go preorder it! Because Glitch is super fun. Set in what appears to be present day, Glitch follows the friendship of two teen buds: Izzy and Eric. 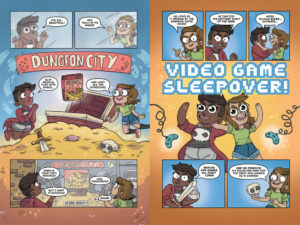 They excitedly plan a weekend of pizza and gaming as their soon to be new addiction Dungeon City has been released on their favorite console. However, almost as soon as Izzy promises Eric that she won’t play the game without her, she does…and literally gets sucked into the game, only to find that she must save the game’s world by defeating dungeons and building the friendship meter with her in-game robot guide Rae. Izzy becomes obsessed with saving this land, to the detriment of her real life in all facets: school, home, and friends. And as the balance of game and real life intensifies, Izzy’s life becomes much more complicated. The story is good, but what makes the book a getter is the humor, and it comes from the images as well as the writing. Sarah Graley is a great comedic writer. A writer and artist for the Rick and Morty comic, the silly nuanced images that she has mastered land well here, and the jokes, while younger reader appropriate, will also appeal to a broader audience. The colors are fantastic, and the swapping of black and white gutters to full-color backgrounds when switching from real life to video game life works well. Also while simple, the panel/page layouts do vary quite a bit. Add these aspects to some of the more unique dialogue/sound effect lettering, and you have a graphic novel that’s not only fun to read but one that’s also teaching young readers some of the more complex aspects of graphic novel storytelling. Glitch is an action-packed 180+ page read that’s funny, paced well, and looks great. And I didn’t even get into the fact that the book contains some super-cool lessons/themes…because it does: friendship, family, priorities. Sarah Graley is a refreshing voice. Her fun art and knack for comedic timing will never fail to entertain me. Put Glitch on your radar; it drops on May 14th! Here is the link to the Amazon page. It’s available for preorder! Happy reading! Check back all week for new graphic novel reviews.